I published an article a couple of years ago with 14 varieties of fruit and vegetables that suit smaller gardens, as well as another giving detailed information about container growing, also helpful if you’re growing on a balcony. The varieties might include tumbling container tomatoes or cut and come again salad leaves, strawberries or in slightly larger containers, leafy kale instead of whole cabbage. 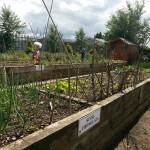 We’ve practiced growing vegetables in small spaces in several community gardens over the years but in Gleann na Bearu, a community garden in Bagenalstown, Co Carlow with an overall space of 14m x 8m, we’re hoping it will give visitors and participants ideas they can replicate at home. 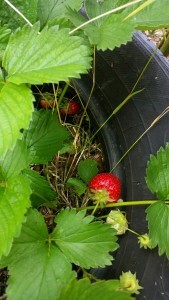 Last year almost all the growing in the garden took place in old tyres happily donated by the local tyre shop. The teenagers from the youth club painted them with donated paint (and anything else that didn’t move). 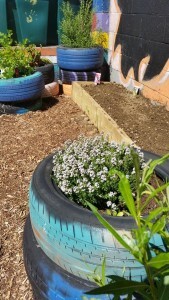 We then lined the tyres to protect them from the rubber with weed membrane, then filled them with multipurpose compost and added the plants where they flourished. You can grow almost all vegetables in containers once they’re large enough and have drainage. When the tyres were stacked three or four high to give the displays interest and save on soil, we filled them to around two-thirds deep with empty plastic bottles before adding the weed membrane, compost and plants. 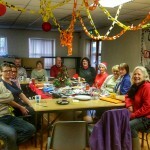 This worked very well and gave us another opportunity to talk about recycling and waste. Over the winter months we added raised beds to the garden design, some large, some small, which helps to give visual ideas for people who want less of a upcycled look in their own gardens. These are very easy to work at and have helped ease childhood memories of stone picking out in the fields where their parents grew vegetables. 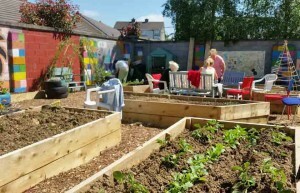 The volunteers are instead discovering that growing food in raised beds is productive, they look tidy, are low maintenance and can be relaxing as the group work away outside. This year we’ve started to think vertically. 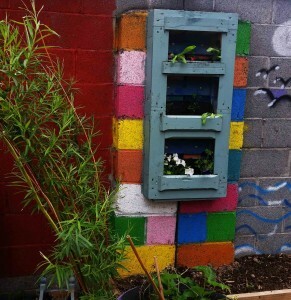 Mr G took apart a single pallet and rebuilt it into a vertical wall planter that for the moment we’ve added bedding plants to, grown by the community gardeners. 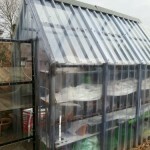 Next year it might house salads, strawberries or herbs alongside more vertical neighbours. I would love to share with you how Ian made the vertical planter pictured but every pallet is different so it really depends upon what you’re faced with. 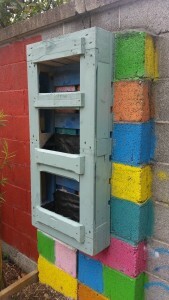 To make a planter like this one, the trick for anyone with woodworking skills is to assess the pallet they have in front of them and only remove the pieces of wood that are absolutely necessary. Pallets aren’t easy to dismantle due to their curved nails so the less they’re messed around with the better. In this example Ian cut the pallet completely in half, leaving the top (the back) in one piece. He then used the pieces he’d removed to fill in the sides and make shelf planters in the front. 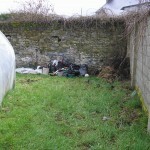 Weed proof membrane was then stapled into each planting area before adding multipurpose compost and the plants. Pictures speak louder than words so zoom into the photos if you can for a better look. On another wall in the community garden tyres have been hung up, colourfully painted and planted, having had drainage holes drilled into them first. Very soon we’ll be adding a small, safe pond to the garden that we hope will attract beneficial wildlife and insects. I need to research whether we can grow watercress for another edible addition to the garden; I’ll share with you how we get on with that project soon. 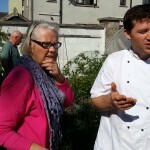 The Gleann na Bearu community gardening project has been a real joy to work with and more details about how it begin and the different funding streams its attracted can be found on the Community Gardens Ireland website where the garden featured as an In Focus article recently. 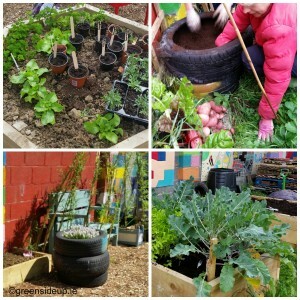 We’ll be continuing to stretch our imaginations in this garden, giving people ideas for growing food in small spaces or using recycled materials. If you have any tips or suggestions we’d love to hear about them.